snow arrived as november ended i've been observing from my bedroom above all week not feeling well and unclear as to why… yet... photos stashed from last year around this time imagining the ground would look similar now if i could examine it more closely grateful for memories collected and saved for times such as this i hear bitter winds howling as night falls feel temperatures dropping rapidly as a draft sneaks between window sashes why does december seem like such a surprise? Sorry to hear you are not feeling well. 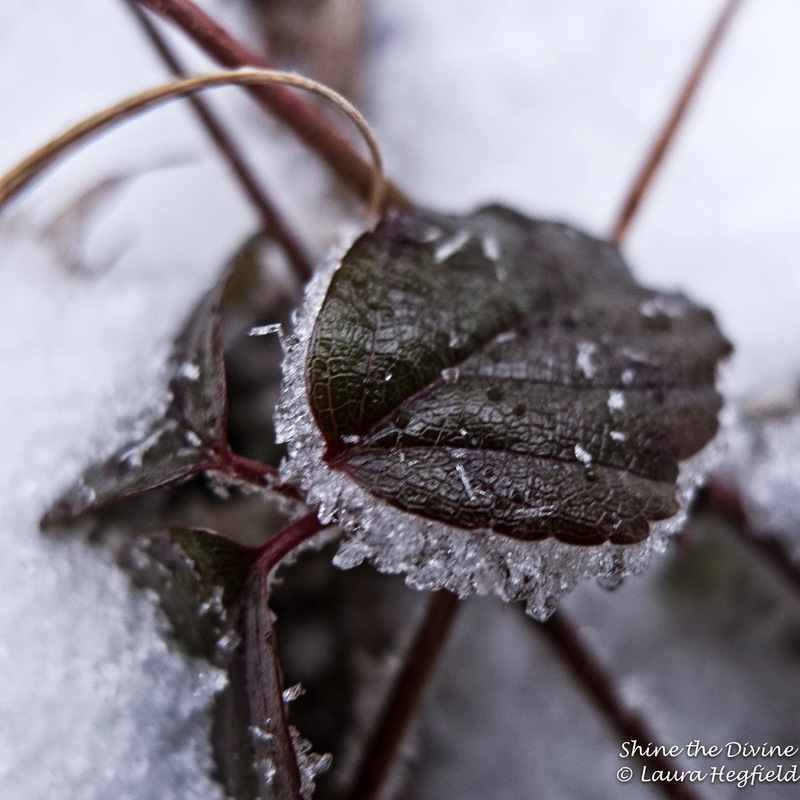 My favorite shot is the third one-lovely snow crystals around the leaf edge-exquisite. Laura I am sorry to hear you are not feeling well....but your memories of snow last year are beautiful to share...sending you healing thoughts. I'll link in with my second blog tomorrow! Do hope you are feeling better dear Laura. Exquisite photos of the snow crystals. Wonderful macros. I know what you mean about December's arrival....We have snow and ice here, which is a surprise although not that unusual. I think winter should wait but maybe I would never be ready. Sorry you are not feeling well in the wintry weather. You'll get better soon, I am sure. Hot tea? I particularly love the "heart of snow" image. Beautiful shots! Sending healing energies for you! I hope you are better soon, Laura. You have captured some wonderful images. your photos of the first snow are wonderful. You live in such a cold place, it seems like you can always find lots of ice crystals, especially those that form your usual heart. Ha Shem has a heart of love to shepherd us His sheep, and bring safely to the sheepfold. But your's are fine, dear Laura! Beautiful images Laura, I hope you are nice and cozy and feeling better! Stunning photos as always Laura.....love the heart shaped image....stay warm! So beautiful frost, snow photos! Take care Laura...! Lovely images. I'm sorry to hear that you're not feeling well. Glad you have stored memories and photos. Hope you feel better very soon. I'm sorry you're not feeling well. These shots of the fallen snow are lovely. So beautiful Laura...the snow and ice are magical through your eyes! Lovely images, hope you are feeling better soon. These are super fabulous macro shots. Each year is the same--season follows season--yet, you are not alone with your surprise of each arrival. I guess we want each portion of the year to last just a bit longer. Praying that you can be out and about again soon. The snow crystals look like tiny stars that fell from heaven. I think they fell to be near you. If I were there, we could feel ikky together, then maybe have a good chuckle about it. Hugs to you. Hope you feel better soon. Beautiful snow photos. Thanks for sharing these 12 days. That's what I call a 'good use of now'! Love this series of images. Sweet. dearest how gorgeous is this delicate snow heart! i hope you are feeling stronger and enjoying this season of light and renewed hope.